Our approach is to climb this line "alpine style." In other words, we climb the normal West Buttress route up to Camp III at 14,200 feet to acclimatize. Leaving a cache of food and fuel at Camp III, we descend back down to Camp I at 7,800 feet with light packs. This approach will allow us to efficiently climb the West Rib in a single push without the use of fixed ropes. The following day we will travel up the Northeast Fork of the Kahiltna and establish a Camp at 9,400 feet. From the base of our route at 11,100 feet, we face a rather spectacular beginning: a 2000-foot couloir of 45 to 55-degree snow and ice. Pitching out this steep section is important because it is very strenuous and there are no options for shelter before reaching West Rib Camp III at 12,800 feet. Once comfortably established on the crest of the Rib, we are confronted with another ice dome that requires additional pitching and climbing on hard alpine ice up to 60 degrees. Above the ice dome the climbing eases some, with a mixture of 45-degree snow and rock climbing as we work our way to Camp IV at 14,700 feet and Camp V at 16,400 feet. On summit day we climb snow and ice couloirs and then easy mixed rock, which leads us to the summit plateau at 19,400 feet. From that point we turn east and climb gradually to the final summit ridge. Besides offering high quality climbing, this entire line of ascent is aesthetically attractive and provides great views of surrounding peaks and routes. As soon as we reach the rib crest we have the impressive outline of the Cassin Ridge off to our east; as we climb higher we see the West Buttress route and then look down onto its 14,000-foot plateau camp; and finally as we ascend the high snow and ice couloirs, we are able to look out to all the major peaks of the Alaska Range. With a descent via the lower half of the West Buttress route, we enjoy varied and remarkably beautiful terrain from beginning to end of this expedition. 1. This is a highly aesthetic line on one of America's most beautiful mountains. Were it not for the extreme popularity of the West Buttress to the left of the route, and of the notoriety of the world-class Cassin Ridge to the right of the route, this line would be one of the most recognized and sought after on the mountain. 2. An ascent of the Upper West Rib misses nearly 5000 feet of interesting and engaging climbing on the crest of the Rib proper adjacent to the beautiful Cassin Ridge. 3. An ascent of the entire West Rib is significantly more committing than an ascent of the Upper West Rib. Many see mountain commitment as an attractive element and seek out trips with such an aesthetic. 4. Many find the exposed and complex terrain of the Northeast Fork of the Kahiltna Glacier to be both exhilarating and frightening. An ascent of the complete West Rib requires late night/early morning travel through this well-known zone. Many individuals are interested in climbing Denali via a route other than the West Buttress, but don't want to commit to something as serious as the complete West Rib. The Upper West Rib provides for a fantastic adventure on a classic line while still providing you with many of the aesthetics found on the West Buttress. On this climb, out team will ascent the standard West Buttress route up to Camp III at 14,200 feet. From there, we will climb up the West Rib Cut-Off to join the upper Rib. 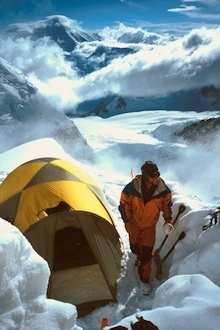 High camp on the West Rib. After arriving at Camp III, most teams will make an acclimatization climb up to the 17,200-foot West Buttress camp. There they will leave a cache set-up for their descent a few days later. After waiting for an appropriate weather window at Camp III, the team will work its way up the Cut-Off to join the ridge crest at 15,700 feet. Once the crest is reached, the climbing is absolutely fantastic. 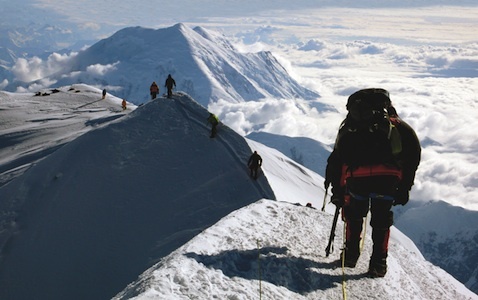 The team will climb a steep and sustained couloir to a protected camp at 16,400 feet. On summit day, we will climb a six-hundred foot steep and windy couloir with sections of sixty-degree terrain to a flat spot at the base of the last crux. 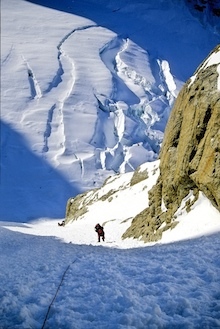 From here the team has two options, a traverse across the top of the infamous Orient Express couloir or an ascent up another steep couloir to the east. Both options top out on the "Football Field," a flatish spot below the final summit ridge. From here, the route once again joins the West Buttress to the mountain's summit at 20,320 feet. Our descent will take us back down the West Buttress route to the camp that we prepped on our acclimatization ascent at 17,200 feet. From there, we will make our way down the West Buttress and back to Base Camp. 1. Climbing the Upper West Rib allows for a lighter ascent. If you climb the complete route, you must carry multiple days worth of food and fuel on your back. If you only climb the Upper Rib, the ascent to 14,200 feet will be sled assisted. 2. After climbing all the way up to Camp III at 14,200 feet, it can be demoralizing to descend all the way back down to the Northeast Fork of the Kahiltna Glacier to start your "real" ascent. 3. Though this is an incredibly physical climb, it is ultimately an easier ascent than the Complete West Rib. 4. An ascent of the Upper West Rib avoids the complexity and the objective danger that complete Rib climbers face in the Northeast Fork of the Kahiltna Glacier. Climbers descending after a successful climb of the West Rib. Feel free to call or email for more information about the West Rib route!